Greek Ore-Ida Totchos with Homemade Tzatziki – What's for Dinner Moms? *I received a free bag of Ore-Ida Tater Tots from @Influenster and @OreIda to create a recipe (#OreIdaTotchos #contest) and review the product for them. I received no other compensation for this article. All opinions and ideas are my own and should only be read as such. I have been on a mission to make different recipes every weeknight for my family for slightly more than 2 years now. We have tried many new ingredients and flavors during our game. My family has found they really love Greek flavors such as garlic, dill, salty Feta and tangy vinegar. 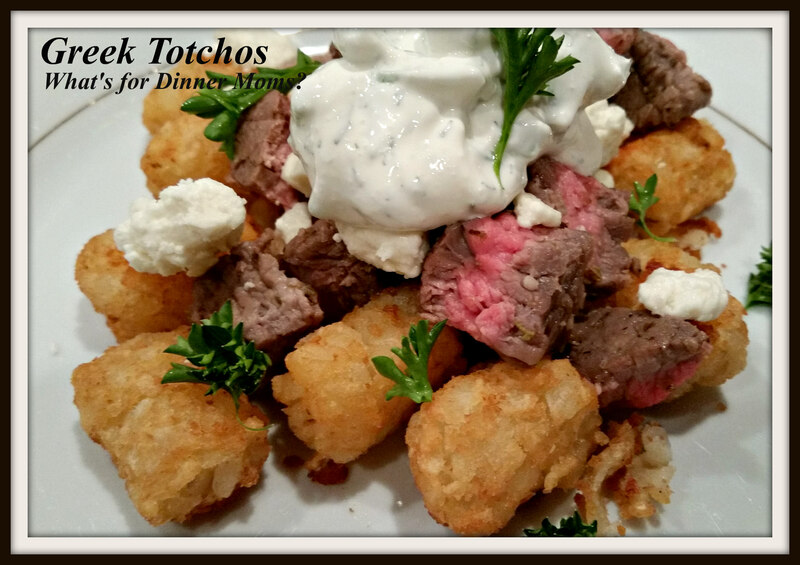 When we were challenged by Ore-Ida to create a Totcho recipe, using their Tater Tots, I immediately thought of the flavors my family loves. I picked up the bag of Ore-Ida Tater Tots on my weekly shopping trip and couldn’t wait to try making Totchos for dinner! This turned out better than I ever imagined. The tangy vinegar and lemon juice in the steak marinade with the creamy, cooling bite of the garlic, dill and sour cream were perfect. A hint of saltiness from the Feta cheese and a bit of crunch from the tater tots led to the perfect bite. I served this with a green side salad. This can also be topped with diced tomatoes, onions or olives as you wish. Place steak, olive oil, red wine vinegar, lemon juice, minced garlic, oregano, black pepper and bay leaves in a storage bag. Shake until all ingredients are mixed. Place in refrigerator for at least 6 – 8 hours to marinate. When ready to make dish remove steak from bag and throw away remaining marinade in bag. Cook steak to your desired temperature (we do ours medium-rare) in your favorite method – grilled, stove top or oven. While steak is cooking begin making Tzatziki sauce. Stir together cucumber, sour cream, dill weed, powdered garlic and a dash of salt. Stir well and taste for flavors. Add spices to suit your taste. We generally use almost 2 tablespoons of garlic, but we love garlic! Once flavors are balanced for your family place the Tzatziki sauce covered in refrigerator to allow flavors to meld together. Remove steak from heat and set aside to cool. Once slightly cooled cut into small bite sized pieces. Cook Ore-Ida Tater Tots according to package directions. Once Tater Tots are cooked remove from oven. Place a serving of Tater Tots on a plate and top with a serving of steak. Sprinkle with Feta cheese and a dollop of Tzatziki sauce on top. Add other toppings as desired. Want to try other great Ore-Ida Totchos recipes? Here is a link to other great Ore-Ida Totchos recipes! Pinning this one. I like your cool quest! I’ll have to give it a try! Thank you! Pingback: Wow! Ore-Ida Shared One of My Recipes – What's for Dinner Moms? Wonderful world with delicious foods. I love the sound of this. Will try it and report back. Thank you! Hope you like them as much as we did! Sounds like a delicious recipe, and thank you so much for liking so many of my posts on laniraeblog.wordpress.com, you are one of my most loyal readers, so thank you! You have a great blog with lots of interesting ideas and beautiful pictures!